September 21, 2010 - Nissin Group is proudly announced Nissin Di622 Mark II at Photokina 2010 and released in the market in September 2010. This is an advanced level model of current Di622, featuring additional functions including Wireless TTL remote responses to Channel 1 Group A controlled by Master Flash, Slave Digital (SD) and Slave Film (SF) flash system with 6 steps power level adjustment. "My TTL" setting and EV compensation setting enhance the joy of photography with custom setting and this new advanced model supports X-contact and external synchronize contact. Front and rear views of the Nissin Di622 Mark II flash strobe. Photo provided by Nissin Japan Ltd.
Slave Digital (SD): Di622 Mark II synchronizes to the pre-flash system. The master flash is to be set at TTL (E-TTL for Canon and i-TTL for Nikon) mode. Slave Film (SF): Di622 Mark II synchronizes to the traditional single flash system. The master flash is to be set at manual mode. Studio lighting system synchronizes to this mode. This mode is also available for open flash, and for a standard flash in the market. 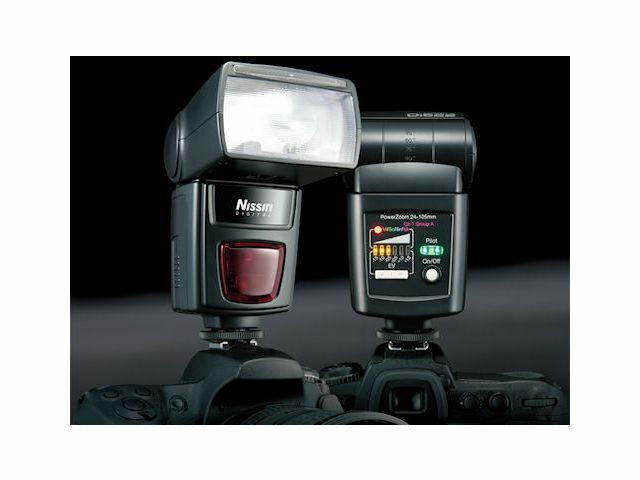 Wireless TTL: Di622 Mark II synchronizes to the wireless remote flash system. The master flash is to be set at Channel 1 group A in wireless remote mode. The TTL flash power level is pre-set for exposure at factory. You can, however, reset the power at the desired exposure level, in +/- 0.75 Ev. by 0.25 Ev increments. The pre-set value is memorized as your personal standard after switching the unit off. 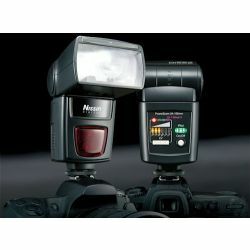 Nissin Di622 Mark II flash strobes in use. Energy Saving Switch to Stand-by mode in 2 minutes., and power off in 30 minutes. after the power on or the last use of flash unit. AF Assist Light Effective range of approx. 0.7 to 6 m / 2.3 to 20 ft. Flash Duration 1/800 (full power flash) sec. 1/800 - 1/20,000 (controlled flash) sec.